Size of this preview: 612 × 600 pixels. Other resolutions: 245 × 240 pixels | 490 × 480 pixels | 784 × 768 pixels | 1,045 × 1,024 pixels | 3,259 × 3,194 pixels. 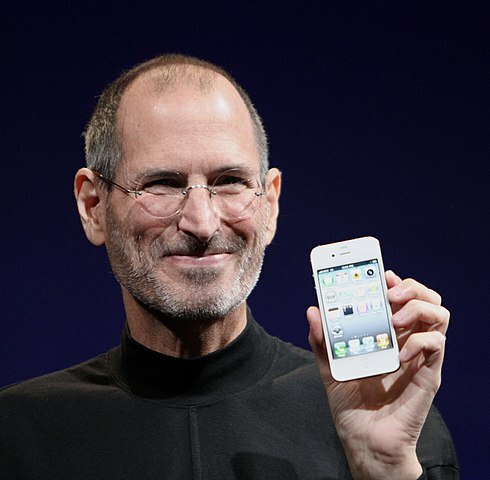 English: Steve Jobs shows off the iPhone 4 at the 2010 Worldwide Developers Conference. Español: Presentación del iPhone 4 por Steve Jobs en la 'Worldwide Developers Conference (WWDC)' del año 2010. 01:18, 7 September 2011 3,259 × 3,194 (1.71 MB) Matt Yohe (talk | contribs) Reverted to version as of 05:28, 10 June 2010 Attempting revert once again which did not seem to work? 00:27, 7 September 2011 3,259 × 3,194 (1.71 MB) Matt Yohe (talk | contribs) Reverted to version as of 05:28, 10 June 2010 | The "Balancing" Maximilian Schönherr applied completely destroyed the saturation on this image. Please don't do that. 05:28, 10 June 2010 3,259 × 3,194 (1.71 MB) Aido2002~commonswiki (talk | contribs) Modified crop, looks more balanced.